The fourth track from Parineeti and Ayushmann’s much awaited movie, Meri Pyaari Bindu is out! Released today, April 19, Khol De Baahein is sung by Monali Thakur and composed by Sachin – Jigar. The soulful song has a mix of Bengali and Hindi lyrics and takes you on a fuzzy trip. It’s warm, full of positive vibes and is the perfect song for young lovers this season. Monali Thakur’s soft voice paired with Sachin – Jigar’s compostion result in a masterpiece which will get you addicted in no time. The song starts off with Bengali lyrics and then transcends into Hindi. Released by YRF Music earlier today, the song is picking up fast and has already crossed 50k views. This is one of the best tracks from Meri Pyaari Bindu till date as it’s the perfect combinations of warm fuzziness and old world charm. 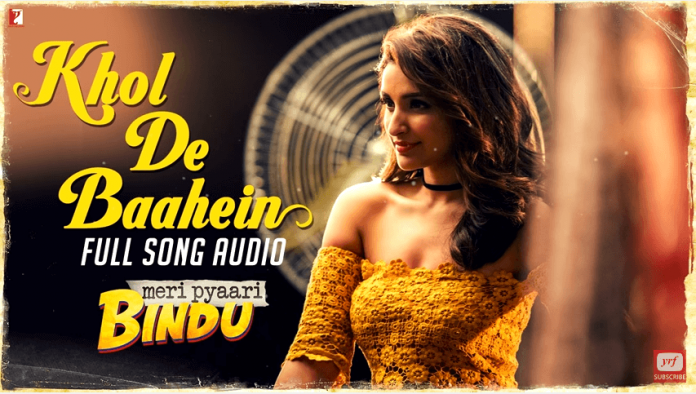 Other tracks from Meri Pyaari Bindu release over the last few weeks include, Arijit Singh’s Haareya, Parineeti Chopra’s Maana Ki Hum Yaar Nahin and Yeh Jawaani Teri, which was released yesterday at a press conference by the lead star cast. Meri Pyaari Bindu releases on April 28, 2017. Stay tuned for more updates on the much awaited movie exclusively on Bollywood Garam. Previous articleAlia Bhatt off on vacation with best friend Akansha Rajan Kapoor - Photos! Next articleSinger turned actor Diljit Dosanjh just bought his first private jet!